We can judge what Medieval Kazan city architecture was like from the ruins of buildings preserved on the site of the city of Great Bolgar, which is easily reached from Kazan city by a short boat trip down the Volga river. Medieval Kazan city was similarly distinguished by its oriental style and, like other important Bolgar towns, had two-storey houses for the feudal nobility, a khan's palace, a law court, a caravanserai, public baths, mausoleums and mosques with elegant minarets. These buildings included fine brick and stone vaulted rooms, many-columned arcaded halls which were decorated with architectural mouldings, frescoes, coloured mosaics, ceramics, stone tracery and marble inlaid floors. It is not by chance that eye-witnesses called the Kazan city of the Bolgar period: "a wonderful city", "the capital of the East'" (S.S. Aydarov). Prince Andrey Kurbsky, one of the conquerors of Kazan city, wrote in his memoirs: "On the hill there are a fortress and the royal palace, and tall stone mosques where their dead kings are laid to rest. I seem to remember there are five mosques". The main mosque of Medieval Kazan was the Kul Sharif Mosque, a huge, white stone edifice with eight minarets, decorated with Bolgar stone-carving. Now in its place in the Kazan Kremlin stands the Blagoveshchensky (Annunciation) Cathedral, erected by Postnik Yakovlev (1556-62), at the same time as this architect was raising the church of St Basil the Blessed on Red Square in Moscow. 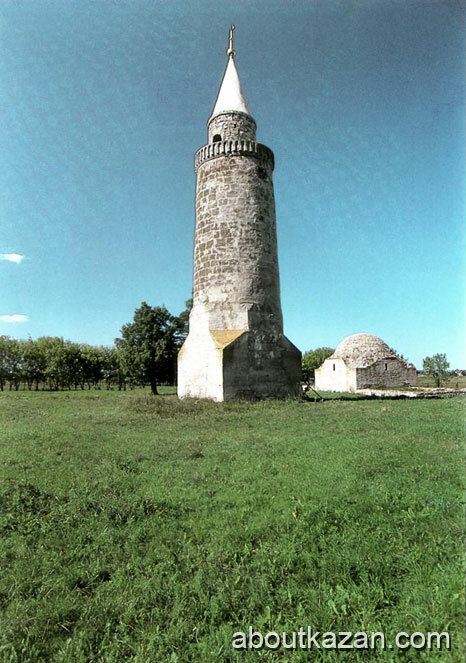 The noted historian M. Khudyakov affirms that the prototype of St Basil's, which was constructed, as is well-known, in honor of the conquest of Kazan city, was in fact the Kul Sharif Mosque, which was destroyed after the city was taken. He writes: "The architectural form of St Basil's is most reminiscent of the Kul Sharif Mosque in Kazan city, with its eight minarets, whose story has been noted down by Mardzhani. The eight towers of St Basil's, crowned by oriental cupolas, show a striking correspondence to these eight minarets". Bereft of its architectural splendours, Kazan city over the course of three centuries turned into an enchanted, bewitched city, where only the indestructible spirit of the people preserved the memory and heritage of their great and ancient civilization. But we will not dwell on all the troubles that befell the Tatar people. From its very beginnings, Tatar Kazan was a multi-national city noted for its religious tolerance. In Medieval Kazan, where merchants from East and West came together, there were both Slav and Armenian settlements with their own places of worship and cemeteries. After the fall of Kazan city, forcible conversion to Christianity began in the Volga-Kama region. Islam was effectively outlawed, in fact, for enormous spiritual and physical burdens were imposed upon those who confessed it: double taxation, military service and complete lack of rights. It is, indeed, a triumph of the spirit that under those circumstances the people were able to endure and, against all odds, preserve their cultural originality and their language. The saddest result of the persecution of Tatar culture and religion was, however, the fact that out of more than eight million Tatars, only a quarter now live on the territory of their historical homeland.